Ready to Play? We got game. We started Athletes Only because we've been there. Frustrated from last minute goalie searches. Frustrated from not enough players showing up for the late night game. Frustrated from asking our friends if we can play on their team (again). a simple and effective app that makes it easy to find players, teams and games. We want you to spend your time playing not searching. Building a team? Need a last minute goalie? With the find a player option you can browse lists of available players and immediately connect with them. Looking for a team that plays at your level? AO's team finder allows you to browse lists of available teams and immediately connect with who you are interested in. Do you just want to play more hockey? AO's game finder allows you to browse lists of available games and connect with the relevant contact for the games you are interested in. Every team has lived through this dreaded scenario -- it's 2 hours to game time, and you can't find a goalie. But at the touch of a button, Athletes Only can save your game. We will notify your favorite goalies and use our database to find a replacement. Let us do the work, so you can concentrate on the game. This is for the team managers. We know how hard filling your roster can be so we want to help. We will cross-reference your team's unique identity (demographic, social, and skill level) with our database to match you with the right players. In order to be more than just a message board, we've built-in the ability to rate teams and players. After playing for a team, a simple survey will be sent to see how compatible the match was. This will be used in our formula for finding you players/teams. But no worries, this will never be shared with anyone and never made public. This is for the player looking for a new team. Based on our database of teams actively recruiting, we will send you recommendations of teams that match your player profile. No more lurking around rinks hoping a team will pick you up, and no more placing ads on internet message boards to complete strangers. Because let's be honest, living on a prayer should not be necessary. Tracking down open hockey is hard work. Even with infinite sources of information at our fingertips, there still isn’t one place that shows all the open hockey in your area... until now. This is just the kind of craziness Athletes Only aims to solve. As a member, you can receive a newsletter each week personalized to your level and the rinks that you play at. We do this because we love hockey! Being an athlete isn’t just something we do. It’s who we are. It’s in our DNA. But post-college, we struggled to stay connected to the game. So we're taking action. We have one mission – to keep the game going by finding the players and teams you’re looking for. We want to make being involved in the sports world just a bit easier, even if only off the ice. Tarah grew up in the hockey town of Toronto, Canada. Her passion for the game landed her a spot on the Jr. A Toronto Aeros. In 2002, Tarah was recruited by Princeton University where she later captained the 2006 Ivy league championship team. Professionally, Tarah has been just as successful. She started her career at Deutsche Bank (DB) where she quickly moved up the ranks. In 2012, she decided to enter the exciting world of start-ups and is still a partner at Personalcare Physicians (the largest concierge medical group in California). Get notified for games that interest you. Pick the specific rinks you play at. 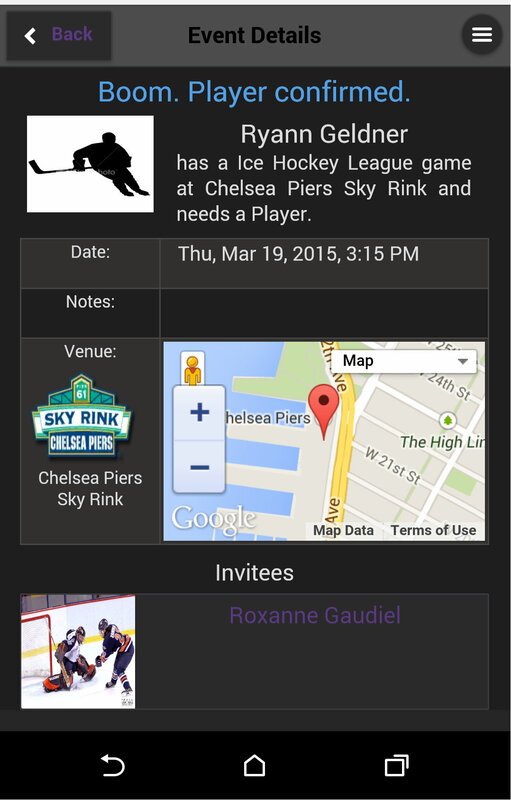 No more invites from random rinks in a 10 mile radius that you can't get to. Get specific by controlling information that is shown and that you see. Request players in a few simple steps.